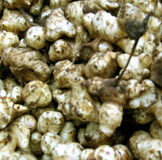 Sunchokes are also known as Jerusalem artichokes. As a member of the Sunflower family, they were one of the few native tubers of North America; Native Americans enjoyed eating sunchokes for centuries before the colonialists settled. Superstitions about the starchy ginger-shaped tuber kept Europeans from cultivating them until the threats were disproved. Sunchokes are less known today, but appear on menus around the Bay Area throughout the Fall and Winter. Their taste falls somewhere between an artichoke heart and a sunflower seed, with a crisp texture and nutty flavor. Chop them into salads, dips, salsa, chutney, or light marinades. Cook them with grilled poultry or fish, or soups, or sauces. When you consider using jicama, water chestnuts, or almonds, try substituting this tuber. Diabetics in particular will benefit from eating sunchokes because the insulin they contain breaks down into fructose instead of glucose during digestion, making them an excellent alternative to starchy foods such as potatoes. Farmers market tip: Choose chokes that are smooth, not dry or wrinkled.